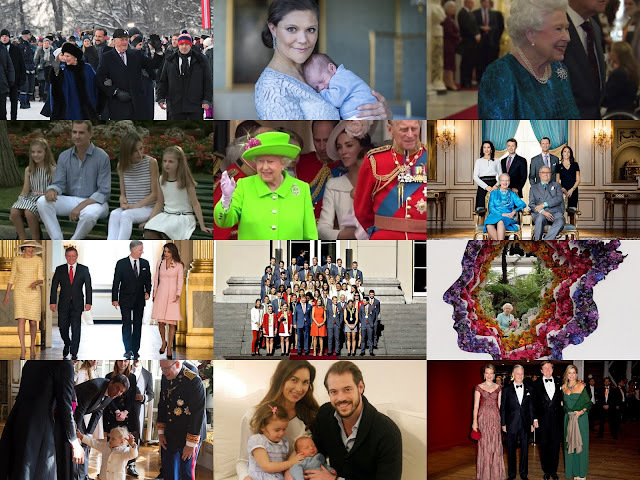 February 2017 may be at an end but it's left its mark on the pages of royal history. We've had endings, big birthdays and an anniversary like no other, all sprinkled with jewels that have set the sparkling seal on the royal month now gone. Here are six royal reasons to remember February 2017. It's a bit of a late entry into the royal ski-ing contest of 2017 but the Dutch Royal Family has headed to the slopes of Lech for their annual winter holiday. King Willem-Alexander, Queen Maxima and their daughters, Amalia, Alexia and Ariane, posed for photos at the start of their stay in Lech and there was plenty of fun to be had as this royal family said hello to the snow. I beg your pardon, I never promised you a rose garden. But you're getting one anyway because this week, the Royal Wardrobe has hit the rose button. We've had all kinds of rosy shades on show this past seven days from pale and interesting to so bright it can be seen from space. Five picks and a poll, of course. Here's the Royal Wardrobe in a week where everything is coming up roses. 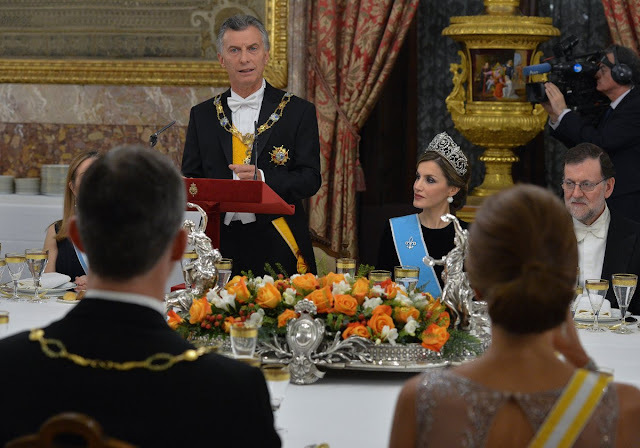 King Felipe and Queen Letizia of Spain welcome the President of Argentina, Mauricio Macri, and his wife, Juliana Awada, for a State Visit this week Stop looking at the tiara. Yes, the Argentinian State Visit to Spain featured the first appearance of Queen Letizia in ‘La Buena’ but other things happened as well. OK, not as sparkly and exciting as Leti becoming just the fourth royal woman to be seen in that towering tiara but still fun. The one thing that really stands out in this State Visit is just how well all four main players involved get on with one another. 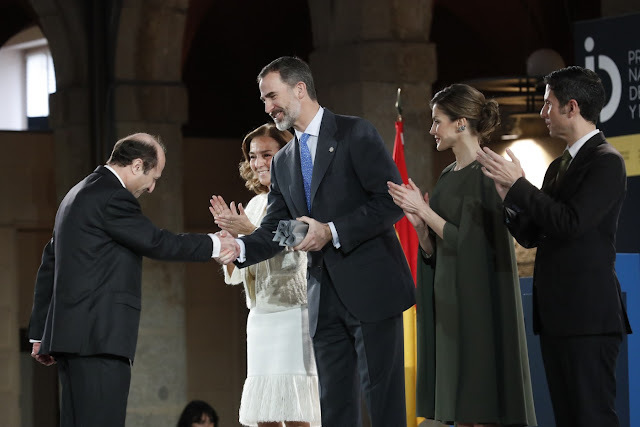 Get ready to smile, here’s how Spain’s royals hosted the Argentinian State Visit. King Carl XVI Gustaf and Queen Silvia welcome the Governor General of Canada, David Johnston, and his wife, Sharon to Sweden on their State Visit (kungahuset.se) We have incoming. 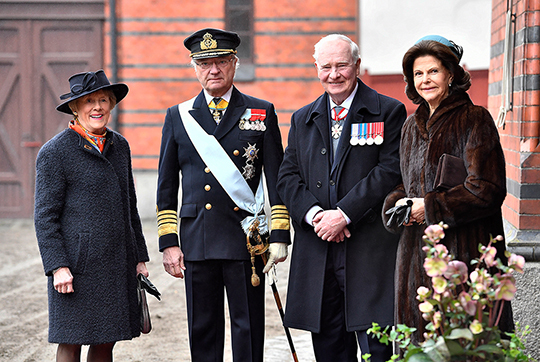 The Swedish Royal Family welcomed the Governor General of Canada this week for a four day State Visit. The trip included business, basketball, tiaras and trucks but no Crown Princess Victoria. Here’s a look back at the week when Sweden welcomed Canada. 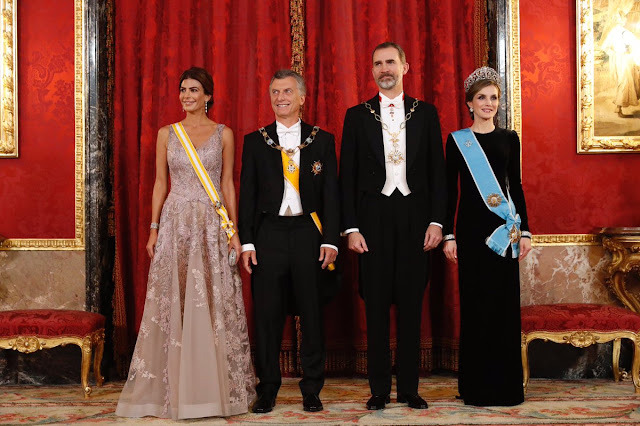 It's quite low key so you may not have even noticed but Queen Letizia wore one of the most famous tiaras in Europe at the State Dinner to welcome the President of Argentina to Spain last night. After her last State Dinner, in Portugal, drew groans at the total lack of tiara, Letizia made sure no one missed the diamonds this time round when she stepped out in the Fleur de Lys Tiara belonging to Spain's queens. Yep, this is a biggie. A diadem only for queens and one which packs a real historical punch. Oh yes, and it's huge. 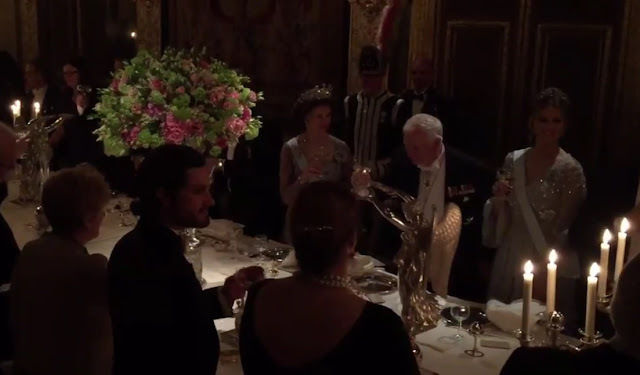 This State Dinner sparkler has caused quite a stir. Sofas are made for lounging on and the future queen of Sweden has it sorted. In her best birthday photos yet, Princess Estelle takes it easy as she hits this landmark celebration. 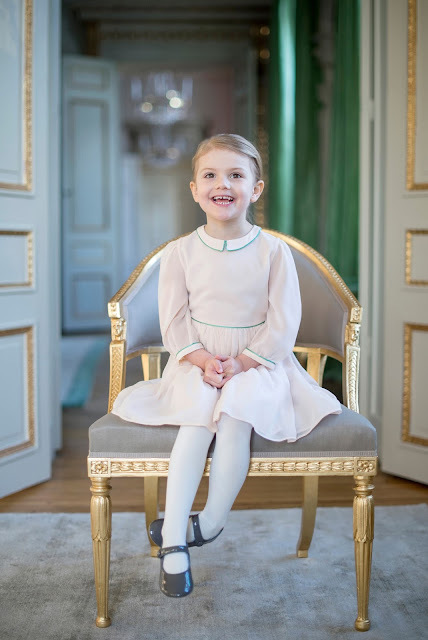 As the fifth birthday of Princess Estelle of Sweden approaches, there's big excitement about special pictures to mark the occasion. Estelle might be holidaying with her mum, dad and baby brother, Oscar, but the chances of this being the first birthday of hers with no official images must be pretty slim. The second in line to the throne of Sweden already has a pretty impressive album of birthday photos to her name. Ahead of birthday number five, here's a look back at some of Estelle's special anniversary photos. State Visit alert. The Swedish Royal Family has been welcoming the Governor General of Canada and his wife as the week gets under way. David and Sheila Johnston are in Sweden for four days and we all know what the start of a State Visit means. Yes, State Banquets. It was glitter as far as the eye could see at the Royal Palace on February 20th 2017 as King Carl XVI Gustaf and Queen Silvia hosted a gala dinner in honour of their guests. Three royal ladies, three tiaras. Enjoy. 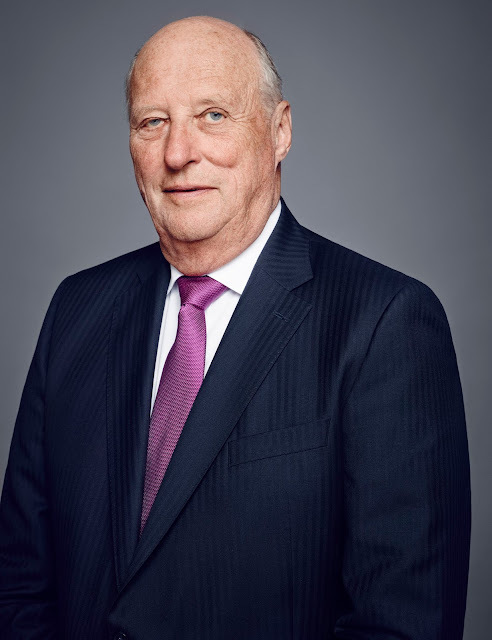 King Harald V of Norway is 80 today. The prince born on February 21st 1937 is now one of the most respected monarchs in the world and about as popular as a royal can ever hope to be. But then Harald has always been loved and respected, as these 8 photos from 8 decades of a royal life show. Leonore of Sweden is three today. 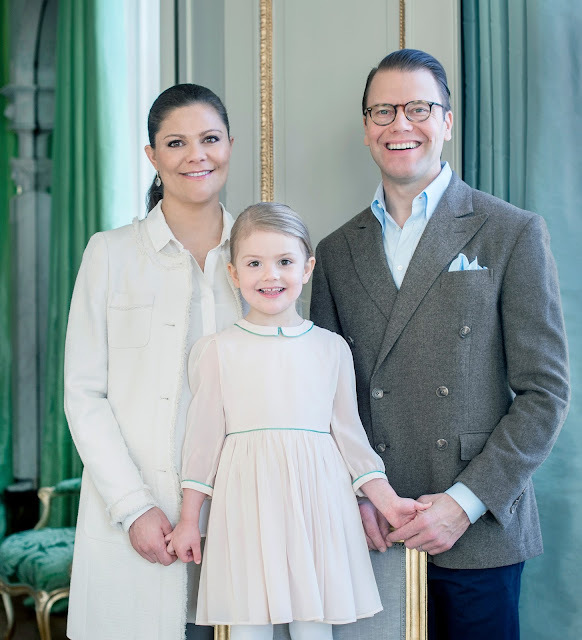 The daughter of Princess Madeleine and Chris O'Neill was born on February 20th 2014 and celebrates her special day with two new official photos. It's been a big royal week with the end of a court case that has hung over Spain's monarchy for over a year, the final moments of a marriage and a serious hospital stay. 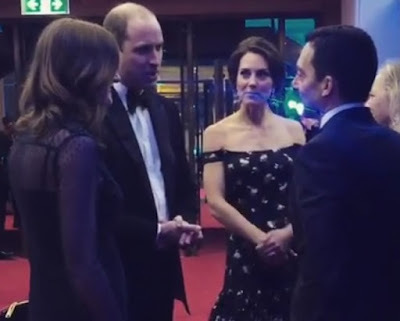 There were some ligther moments too - here's the Royal Week, in 60 seconds. What does royalty dress like in 2017? After the royal week we've had, we need a bit of relaxation so step into the Royal Wardrobe. There have been plenty of regal sightings this week but as we've also got an Herrera evening gown the poll has to be slightly different. Because skinny jeans vs Herrera evening gown isn't going to be tense. Ever. This time round, there are 5 royal outfits worn within 24 hours of each other, but with a different question. Which best fits your idea of modern royal dressing in 2017? If you want to join the debate, check the opinion piece here. Or if you just want to look at the clothes, here they come - and remember to vote. Results here on Tuesday. Images of royalty are everywhere - but what do we really want our royals to look like today? 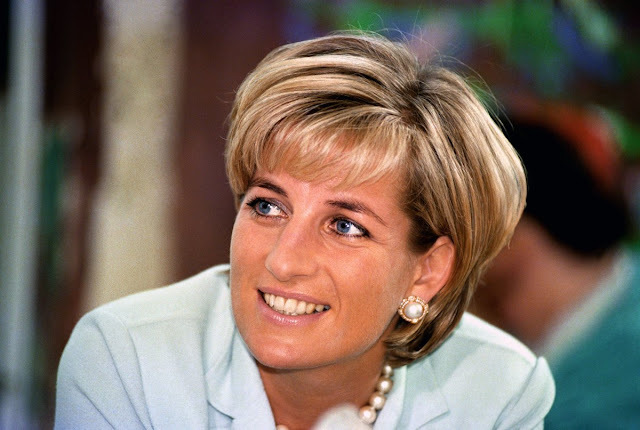 The previews of the exhibition of Diana’s clothes, set to open soon at Kensington Palace, aren’t just a walk down memory lane. 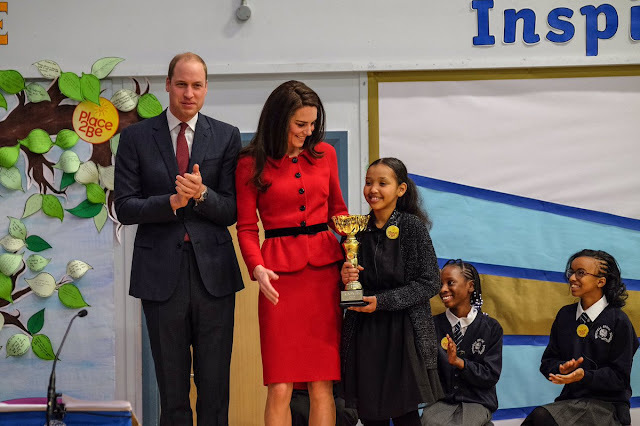 They’ve raised important points about modern royalty. One theme has really struck me. It’s the comments, from designers who dressed Diana, about her sense of royal image. They mention that Diana didn’t just know what she wanted to wear, she knew what people wanted her to look like and a big consideration of any outfit she picked was whether it matched the princess expectation. She knew her hosts had an idea of how royalty appeared and part of her dress code was to make sure they got what they hoped for. 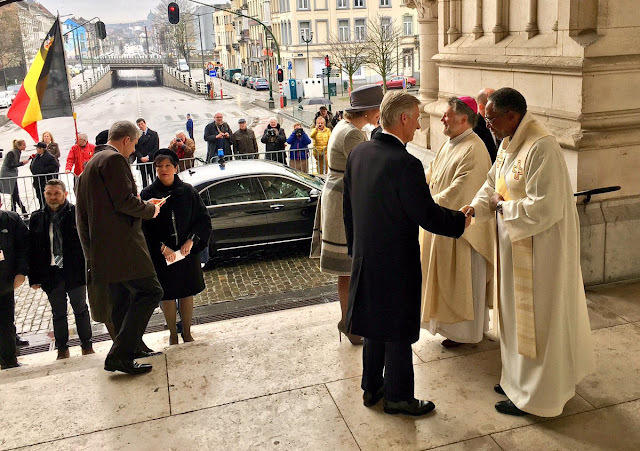 The King and Queen of the Belgians have led commemorations at the mass held every year to remember the members of their country's royal family who have died. The service takes place on February 17th at Laeken where many members of Belgium's royal family are buried. 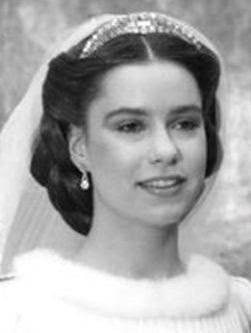 The marriage of Louis and Tessy of Luxembourg is at an end. The couple were granted an decree nisi in London today - it will become absolute in six weeks time. 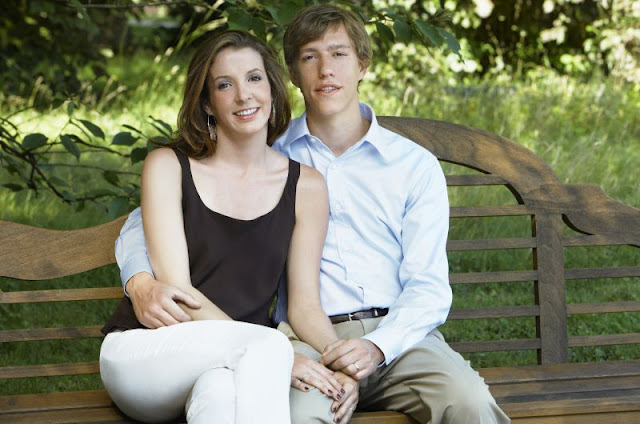 The divorce was requested by Princess Tessy and it was granted on the grounds of Prince Louis' 'unreasonable behaviour', a common term in divorce papers. It's that time of year. After Spain's royals unexpectedly got the (snow) ball rolling (couldn't resist it, sorry) with their surprise ski-ing trip last week, the ruling houses of Europe are off enjoying the slopes and sharing fun photos to prove it. 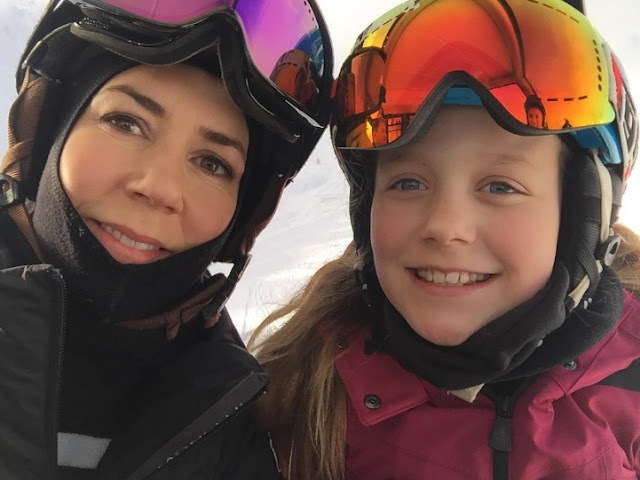 No formal photocall for Crown Prince Frederik and his family as they get their ski-ing fix for the year. Instead, they've shared family pics on social media. And rather nice they are too. 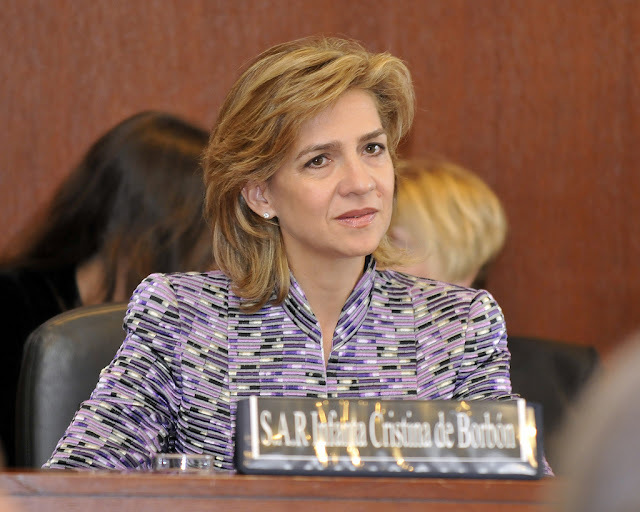 Infanta Cristina has been found not guilty of tax fraud. The Infanta, sister of King Felipe VI and daughter of King Juan Carlos I faces a fine of 265,000 euros after a trial lasting over a year. Her husband, Inaki Urdangarin, has been found guilty and sentenced to six years in prison. Spanish media is dominated this morning by one story – the judgement in the trial of the Infanta Cristina. 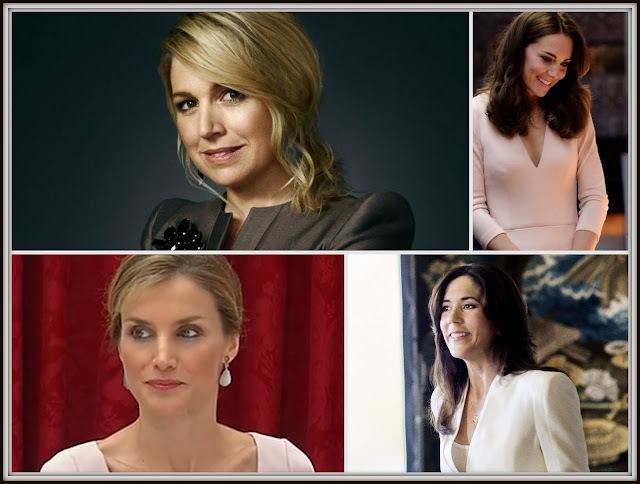 As the clock ticks towards the judgement in the case against the sixth in line to the throne of Spain, her husband and fifteen other defendants, TV, radio and newspapers are filled with debate about this royal story. In Valentine's week, everyone needs a bit of romance and what could be more romantic than the first kiss of a handsome prince and his beautiful princess? The wedding day snog has become a royal tradition just about everywhere and Valentine's is perhaps the best moment to remember some of the most romantic royal kisses - little looks of love that promise so much. You've got to hand it to the House of Windsor. When they get out and about, there's no stopping them. On Valentine's Day we were spoiled by a whole lot of royal love as the Queen and her family headed off on a series of high profile engagements. Let's bring it all together here with the Windsor Wrap. Well, that was a style success and a half. 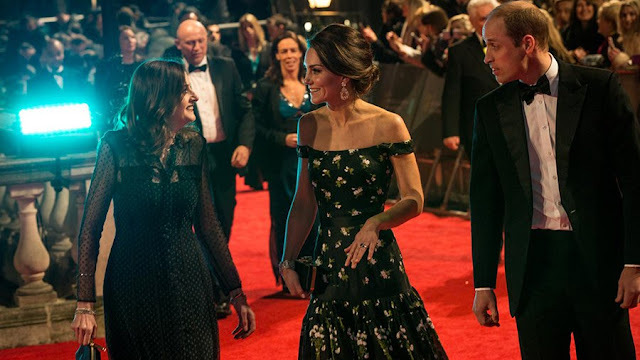 There's been a lot of love for the red carpet look of the Duchess of Cambridge as she sashayed into the BAFTAs this weekend. We got a designer gown AND heirloom jewels, which was always going to be a winning combination. In honour of Kate's gala success, here are ten red carpet looks that went down well for the duchess. Queen Letizia topped this week's Royal Wardrobe poll and it might be a bit of a surprise to hear that it's her first win this year in the style survey. Yes, six weeks into the new year, the queen of chic has knocked everyone else out of the park with a solid style win. February is the month of amethysts and while this stone has a very regal colour - what could be more royal than purple - it's not that popular in current jewel collections in Europe's ruling houses. But when it does turn up in a tiara it's hard to ignore - the colour, the sparkle and the settings usually make for impressive pieces. This month's look at the stone in royal settings now arrives in Norway for the latest part in Amethysts for February. She is a very modern princess who broke lots of new ground and was her country's first lady for many years. 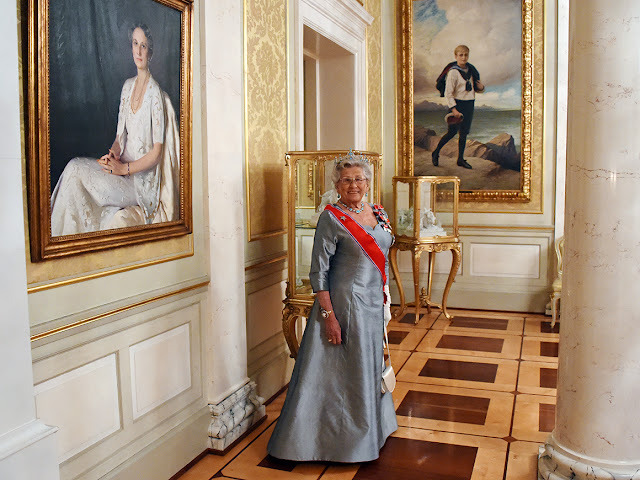 As she celebrates a landmark birthday, Princess Astrid is bringing it all back to mum and dad. In a touching portrait, released to mark her 85th birthday, she poses between portraits of her parents to take her story right back to where it all started. The royal world is all about image. The modern audience want photos and they want them now. We are surrounded by more photos of royalty than ever before and among all the lovely smiles, lovely clothes and lovely moments are some images that provide a bit of a giggle. Here are four off guard moments from the week just gone. Who will top this week's style poll? It's been a strong week in the Royal Wardrobe with some major royal recycling and some new looks that have pleased and divided all at the same time. You have to be in the mood for sleeves this time round as the arms are doing all the talking as February takes a hold. Choose your favourite in the poll at the side of this post, the results will be here from Tuesday. In the meantime, enjoy five outfits from four royals in this week's Royal Wardrobe. There is much excitement today after a book where you can colour in Kate was found on sale in a giftshop run by Historic Royal Palaces. Before you get too excited, this book was first published in 2013 and has been on sale just about everywhere for the best part of four years. Colour in Kate isn't alone in bringing pencil sketches of the Duchess of Cambridge into one handy tome for crayoning and pencilling. 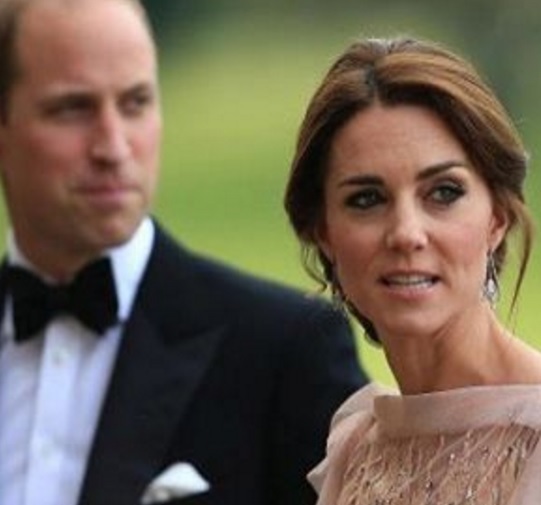 If this latest story has got you interested (and we know, thanks to William, that Kate loves a bit of colouring in herself), then here are 5 ways to get crafty with Kate. 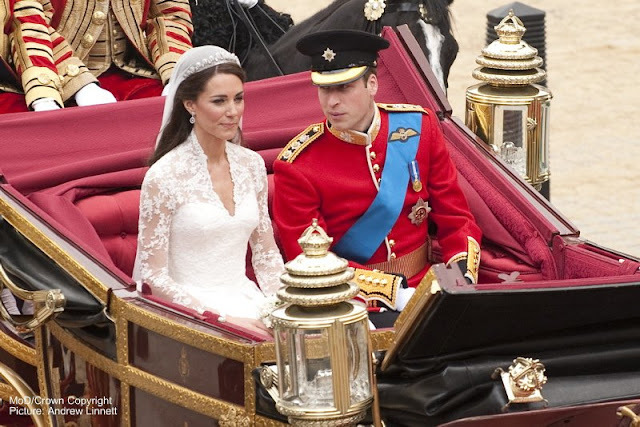 It's one of the most famous royal wedding dresses of all but very hard to define. 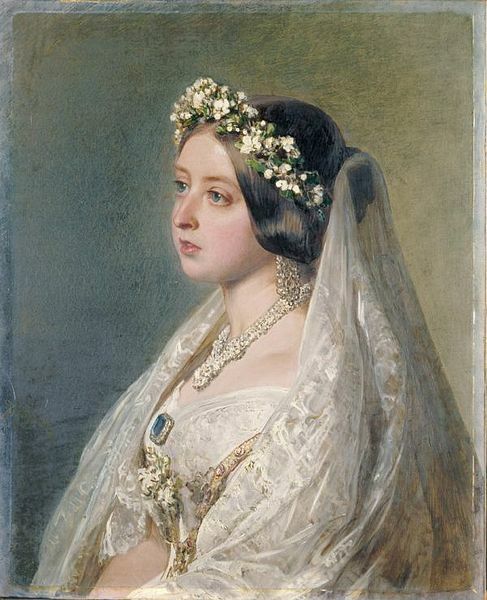 The gown worn by Queen Victoria on February 10th 1840 at St James' Palace to marry her already beloved Albert is credited with making white weddings top of every stylish bride's wish list but try and describe it and you might just come a cropper. Of course, there are no photos (well, possibly but that's a whole other great big royal row) and many of the images we have are of the dress on mannequins in exhibitions. 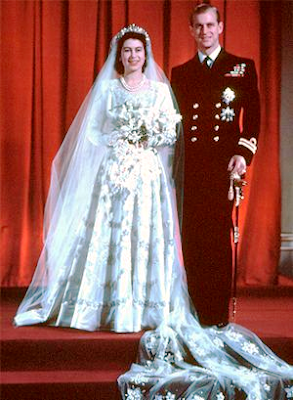 But it is a truly beautiful gown and a part of a royal story integral to the history of the British Monarchy. 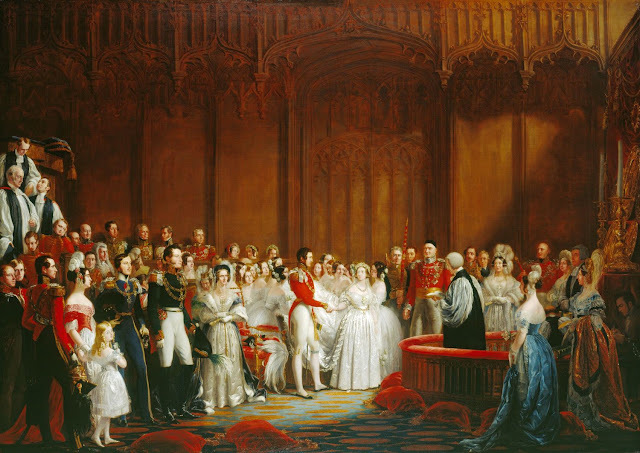 On the anniversary of that famous marriage, here's a look at Queen Victoria's wedding gown. February 2017 is all about the Sapphire Queen but you can't have too many gems. So how about a few amethysts? The purple stone - and purple is about as regal as it gets - is the birthstone for February and it's found in some of the most striking and unusual tiaras used by royal houses today. It's also got a touch of spring about it. a burst of colour that is much needed after the long winter. Plus this particular tiara is linked to one of the most romantic royals of them all. We're off to Sweden to start our journey through Amethysts for February. Royals and romance. They go together likes horses and golden carriages. 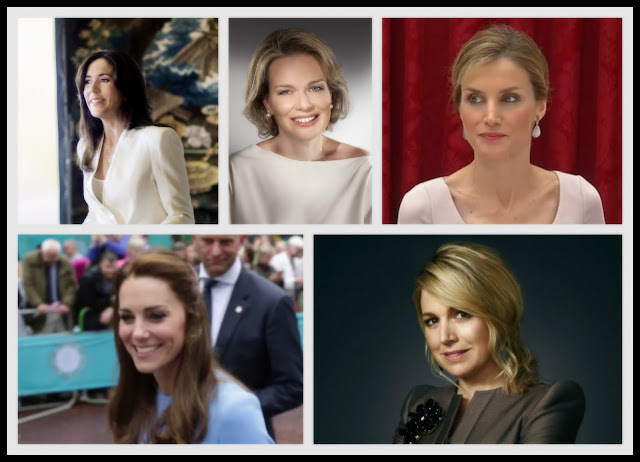 As Valentine's Day starts to wave its red rose, chocolate filled, champagne tinged happiness at us from afar, the royals of Europe are certainly in the mood for romance. There have been endless loved up looks around the continent as the big day approaches - here are 5 of the best to get you in the mood for Valentine's. For years, Spain's royals got the winter sport season started with a ski trip complete with photo call. In the last few years, there's been no snowy snap fest and no on expected one. So there was surprise all round at the weekend when King Felipe, Queen Letizia and their two daughters turned up in snow suits, helmets and skis ready for some action shots on the slopes. Yes, Spain's annual royal ski trip seems to be back on. ...OK, that's it. Christmas is really, truly, properly, completely and absolutely done for another year. Bin the left over mince pies (they might be good til the end of the month but you didn't enjoy them that much at Crimbo), put the card that fell down the back of the radiator in the recycling and try and vacuum up the last of the pine needles. The Queen has left Sandringham and is on her way back to London. Christmas is done. 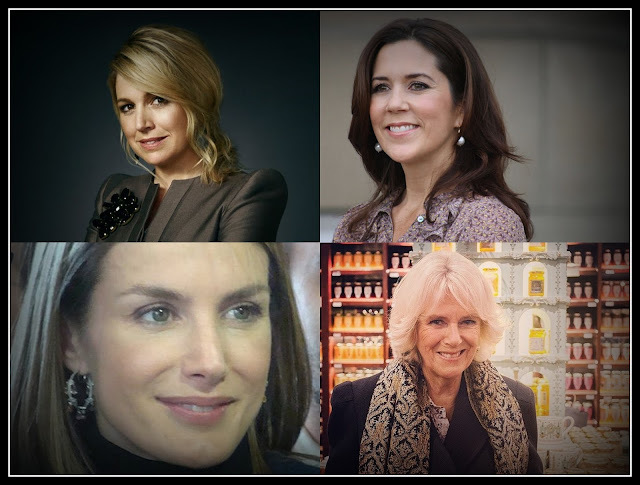 Crown Princess Mary has claimed a second win in the Royal Wardrobepoll for 2017. Her style statement at the style summit that is Copenhagen Fashion Week topped the survey to find the most popular outfit of the week just gone. The Heads Together campaign is building a head of steam. 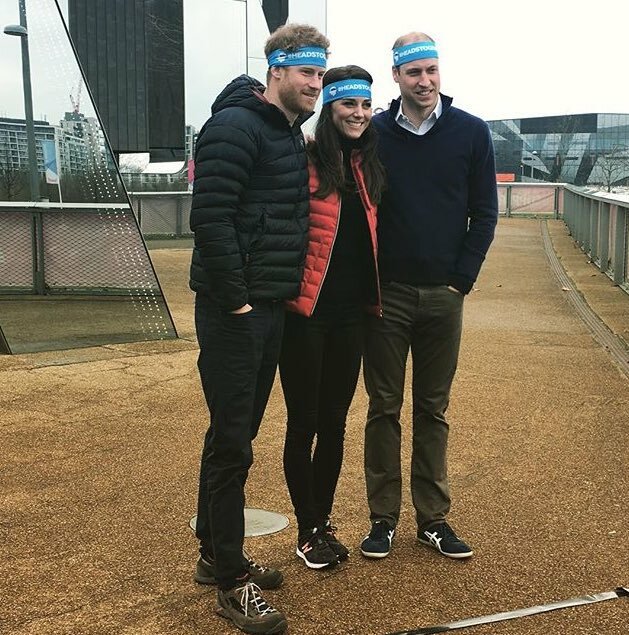 In the last three days, William, Kate and Harry have been at the forefront of a series of engagements to highlight mental health issues. We've had races, we've had speeches and we've had a new series of heartfelt appeals to talk about problems. These have been real red letter days for these royals. She's about to turn three and enter a whole new chapter of her young life so what better way to get ready than a girl's day out with mum? 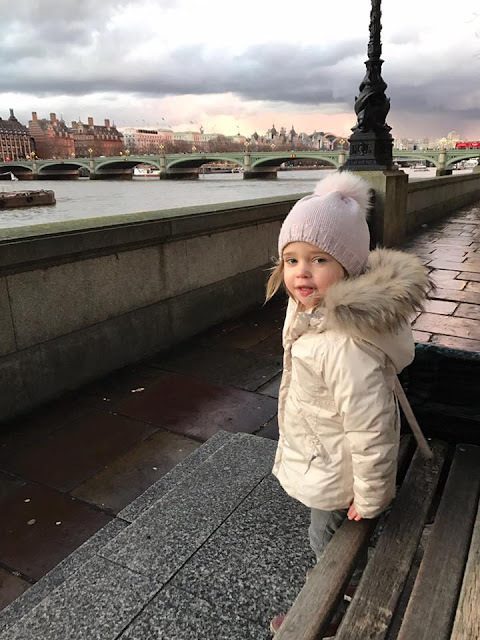 Princess Leonore of Sweden, who celebrates her birthday on February 20th, has been out and about in London with mummy Madeleine who took to Facebook to share their trip. Today, Elizabeth II writes her name in the history books once more. 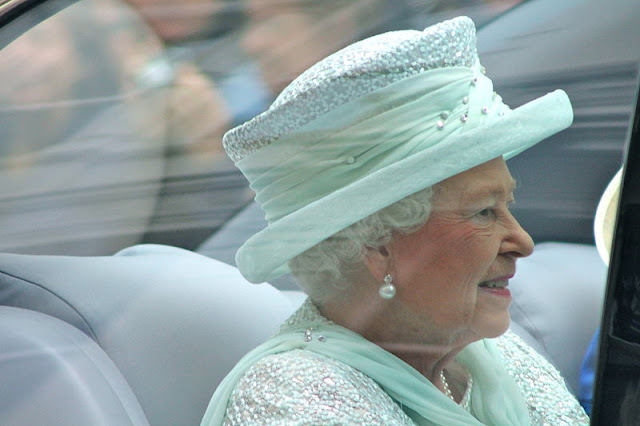 The Queen has now reigned for 65 years - she is the first British Monarch to reach this milestone. It is her Sapphire Jubilee. The stone represents wisdom and royalty - an apt moment in a reign that is now legendary. To celebrate this royal 65 years, here are ten special sapphires worn by Elizabeth II - the Sapphire Queen. The Queen is marking 65 years on the throne today and reminding us all that she is part of a dynasty that stretches back further and a family that goes beyond 'the Firm'. For the official photo, shared for this Sapphire Jubilee, is as much about her father, George VI, as it is his daughter, Elizabeth II. 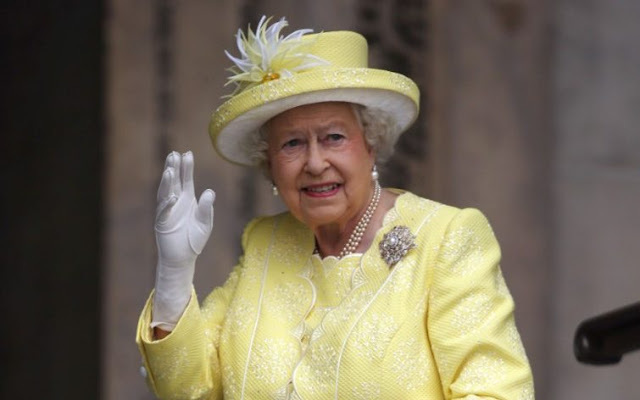 The Queen marks the 65th anniversary of her accession today. 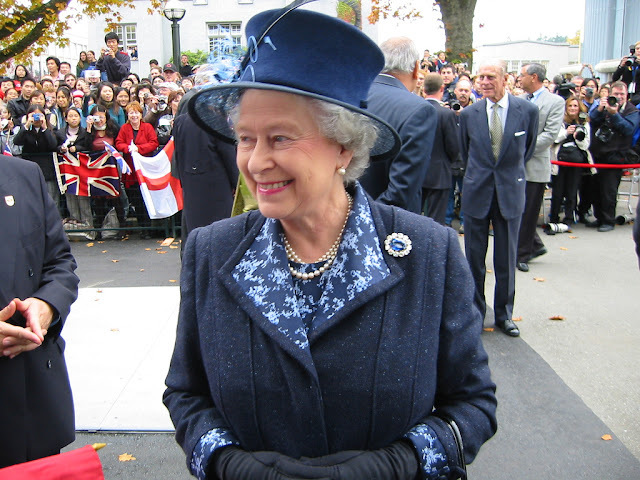 It is the jubilee associated with that most regal stone - Elizabeth II is now the Sapphire Queen. Just five years ago, the Diamond Jubilee floated into view and set everything sparkling. We had flotillas, we had beacons, we had dinners filled with monarchs, we had street parties. We even had the Queen and James Bond (yes, that was the Olympics but we were all so excited by then they blended into one). Most of all, we had water. Elizabeth the Second celebrated her Diamond Jubilee with quite a lot of the style of Elizabeth the First, taking to the water throughout the whole event. 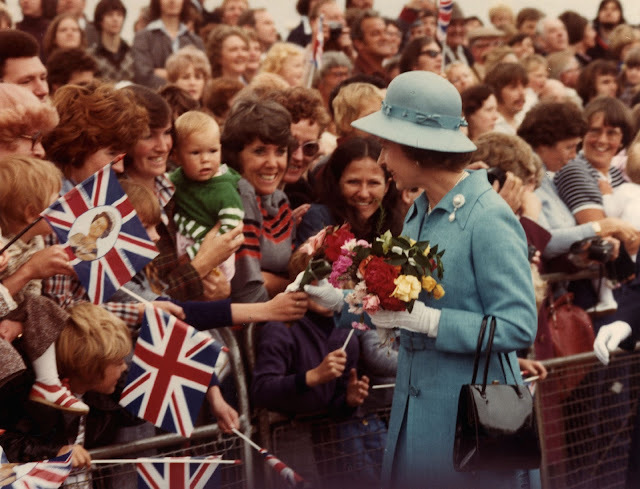 Settle back and enjoy this trip down (recent) memory lane as the final landmark ahead of the Sapphire celebrations is a look at the Queen's Diamond Jubilee. In less than 48 hours time, Elizabeth II adds another milestone to the record breaking story of her reign. On February 6th 2017, the Queen will have reigned for 65 years - the first British monarch to reach that landmark. It will be a day spent quietly, in reflection, but there is also huge excitement as Elizabeth II becomes the Sapphire Queen. 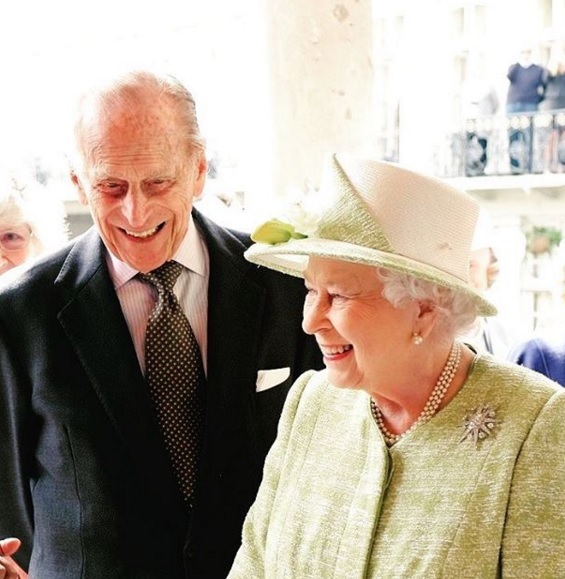 It's one of many milestones in her reign and today there's a look at the wedding anniversaries that have celebrated the success of the partnership that is Elizabeth and Philip. Enjoy some more landmarks from the life of the Sapphire Queen. Then it got serious. After several weeks of warming up with big coats and bright colours, suddenly the Royal Wardrobe brought on the A Game. Everywhere you looked, there was some serious style to be contending with. Sharp suits, brave cuts, retro chic - you name it, we got it this week. It's going to be hard but there is a poll to pick your favourite - at the side there, just peek right. Results on Monday but now it's time to enjoy the week the Royal Wardrobe got serious. OK, we've had silver and gold and you know you're getting diamonds but as the lookback at the landmarks of Elizabeth II's reign continues, let's take a break from the Jubilees just for a moment and concentrate on a cake event. 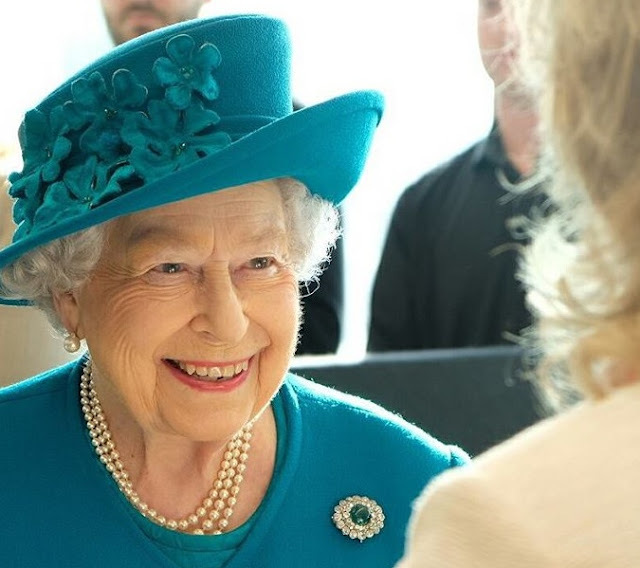 As well as major anniversaries, the Queen's record breaking reign has, of course, taken in big birthdays and some of them have turned into celebrations just as big as the jubilees. As Elizabeth II approaches the 65th anniversary of her reign, here's a look back at some other landmarks - the Queen's big birthdays. 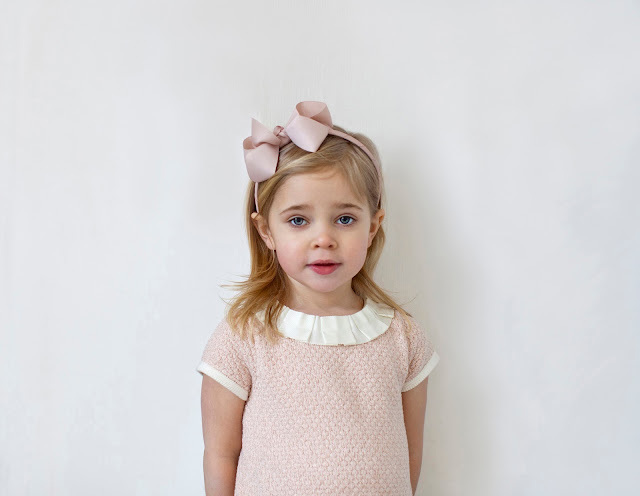 Princess Estelle, at almost five, has already got royal photos sorted. Now it appears she's got another major role under her belt - the big sister handling a little brother. In a new set of photos released by the Swedish Royal Court, the second in line to the throne tries her best to ignore the impending invasion of the third in line to her game while baby brother carries on regardless. Welcome to the world of being the eldest, Estelle. 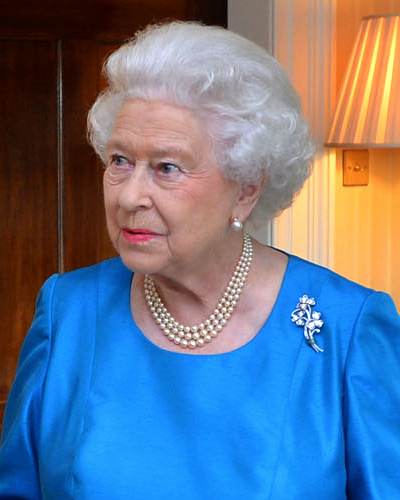 The Queen is about to become the first British monarch to mark a Sapphire anniversary, 65 years on the throne. Ahead of that, here's a chance to look back at some other landmarks in her reign. 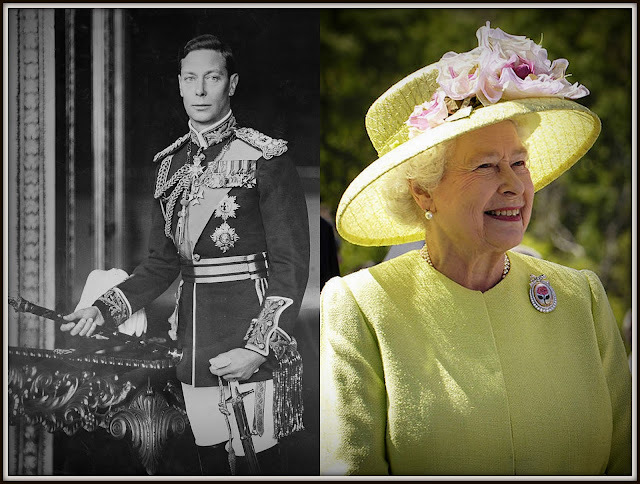 Yesterday was all about the Silver Jubilee while today looks at perhaps the most difficult of the major milestones for the Queen, her Golden Jubilee. The celebrations for 50 years of Elizabeth II came in the year her mother and sister died while the Monarchy itself was still recovering from a decade of unhappy times that had seen three royal divorces and the death of Diana, Princess of Wales. Despite predictions the Golden Jubilee would be a disaster, it turned into a triumph. Here's how the Queen marked half a century of rule. 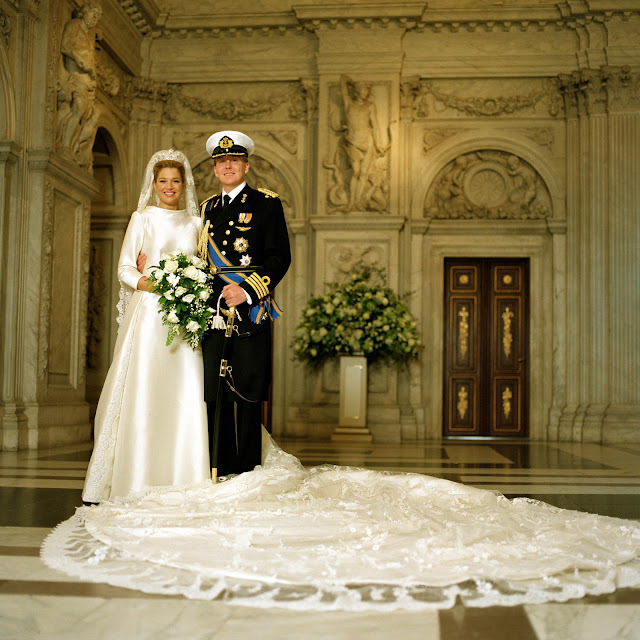 On this day, fifteen years ago, Maxima Zorreguieta married her handsome prince and wore a very beautiful dress to do it. 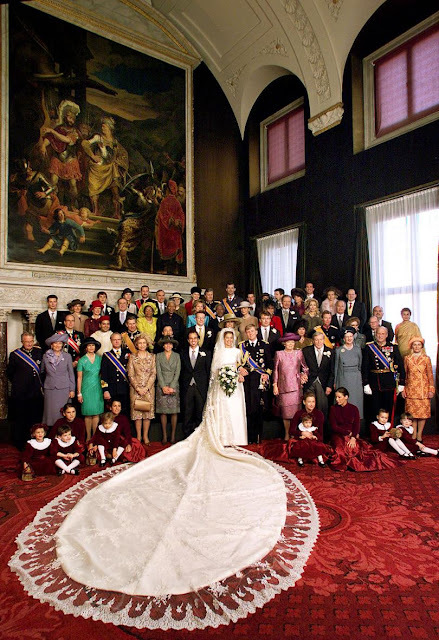 The now Queen of the Netherlands turned to one of the best known designers in the world for her most famous gown. Maxima joined a very select group of royals who have been Valentino brides. Settle back and enjoy some very haute couture. In a week of big colours, it was pale and interesting that won out. 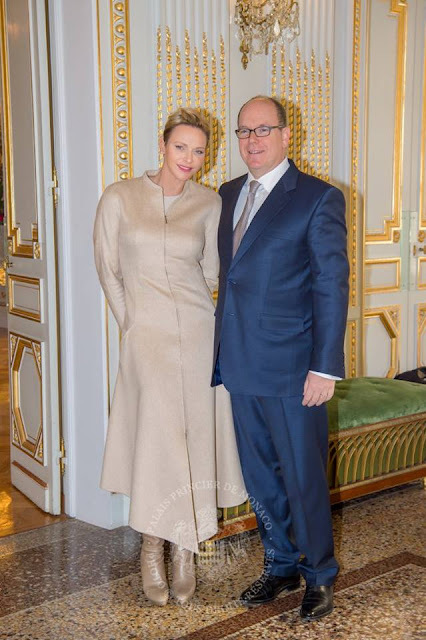 The cream and caramel mix chosen by princess Charlene of Monaco for celebrations marking the feast of the country's patron saint, Devote, topped this week's Royal Wardrobe poll. Elizabeth II breaks yet another record this week as she becomes the first British monarch ever to celebrate a Sapphire Jubilee. On 6th February 2017, the Queen will have reigned for 65 years. It's another landmark in the epic rule of Elizabeth II and while the day itself will be marked quietly, it will claim a place in history all of its own. Every day in the countdown to this epic milestone, there will be a look back at some of the other landmarks of this record breaking reign starting with the Silver Jubilee, the first major milestone of Elizabeth II, the Sapphire Queen. Stand by everyone, it's February, it's birthday time and that can mean only one thing - a new portrait of Princess Estelle when she celebrates at the end of the month. Calm yourselves, before we get anywhere near that we've got a plethora of parties and cards to plough through. Get that cake ready, raise a cuppa in celebration - here are 12 royal birthdays for February. Nostalgia ruled Instagram as 2017 began. Maybe it was the memories of times past brought about by the passing of an old year but there was a lot of looking back as January unfolded. The most popular image on official royal accounts was over twenty years old and over 80,000 likes ahead of all others and it was only posted on January 29th. The best liked images were those of well loved royal women who spent decades winning fans and a place in regal history. Here's how Instagram got royally reflective in January 2017.